GHOST unveil new leader…. Cardinal Copia! 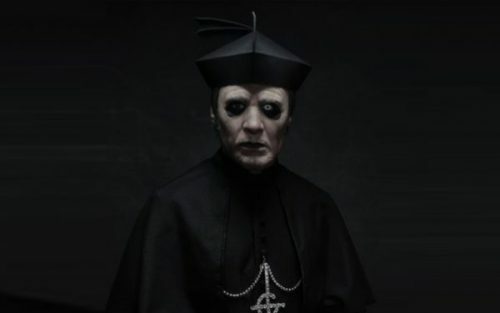 GHOST has unveiled the “new” Papa in a three-minute video clip titled “Introducing The Cardinal.” In the clip, the band’s “new” leader comes face-to-face with an aged Papa Emeritus Zero and Sister Imperator after arriving from behind a door, bathed in red light. The new Papa, who is named Cardinal Copia and apparently isn’t a part of the Papa Emeritus bloodline at all, sports a thin mustache and has heterochromia iridum, a condition where the iris of one eye is a different color than the iris of the other eye. The band posted the following on their official Facebook page. We wish to inform you our new leader has arrived. The last Papa, Papa Emeritus III, was forcibly taken from the stage during the final show of the band’s “Meliora” tour cycle last fall, with Papa Zero arrived to announce the beginning of “the Middle Ages.” Of course, all the Papas — except the elder Zero — are the same man, GHOST founder and vocalist Tobias Forge. Forge‘s new alter ego will make his live debut on May 5 as the Swedish band kicks off a run of North American dates in Riverside, California. The “Rats On The Road” trek, as it’s called, will be in support of the group’s fourth studio LP, which is tentatively due in June via Loma Vista Recordings. The disc was recorded last year at Artery studios in Stockholm with producer Tom Dalgety (OPETH, ROYAL BLOOD) and was mixed in January at Westlake Studios in West Hollywood, California with Andy Wallace(NIRVANA, SLAYER). Songtitles set to appear on the LP include “Rats”, “Life Eternal”, “Faith” and “Dance Macabre”. “Rats”, the album’s first single, is expected to arrive later this month. GHOST will kick off a U.S. tour on May 5 in Riverside, California. GRAVEYARD Premieres “Please Don’t” Video!